Navigating the dating world can be tricky, but when you finally find that special person the hard work seems all the more worth it. People are getting busier and busier, which makes dating even harder to do. Many dating applications have been created to solve this problem in an era of growing technology. So we asked ourselves, why does getting to know somebody have to be hard? In the beginning, we set out to create an application that incorporates virtual reality. In the end, we put our own twist on current dating applications to provide a fun, safe and new way to interact. MeetVR is a web-based application that allows users to step into the world of another with help of our current virtual reality capabilities. With the virtual reality, you can look around another’s world to grasp a better understanding of a person. The VR technology allows the user to interact with the environment that their interest is speaking in and gain a more complete understanding of who that person is. Users can notice the guitar in the corner of the room or the spread of National Geographic that they have laid out on their coffee table. The initial details that users will pick up on in just one visit to another users profile page is pivotal in the dating world, because they will know if they are compatible sooner than later. Users can login to the site and begin browsing through local singles. When a user has found somebody of interest, they can choose to look through pictures, read their provided biography/interests, watch a virtual reality profile video or a combination of the three. Once they have decided if there is a potential match, they can chat with them. 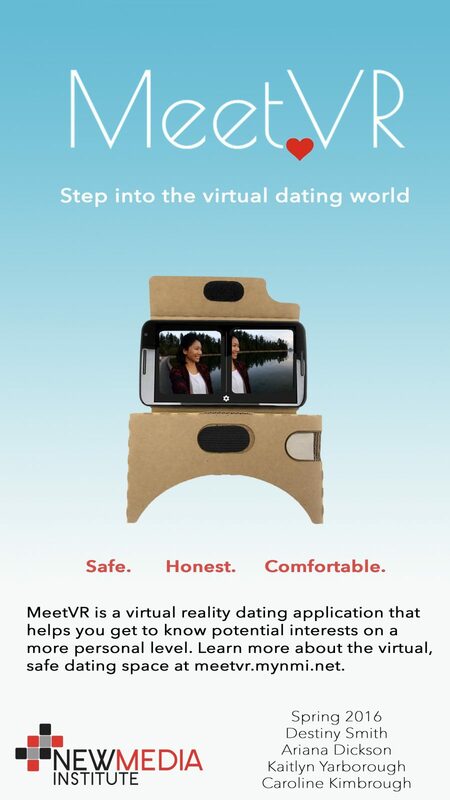 The combination of MeetVR’s capabilities jumpstarts the process of meeting new people and potential love interests in a fun and intimate way using new technology.